Ayr is a town and port situated on the Firth of Clyde, in south-west Scotland. With a population of around 46,000, Ayr is the largest settlement in Ayrshire, of which it is the county town, and has held royal burgh status since 1205. Ayr is the administrative centre of the South Ayrshire council area, which is the unitary local authority. To the north of Ayr is the adjoining town of Prestwick, famous for its golf and its aviation industry as home of Glasgow Prestwick International Airport. Other neighbouring settlements include Alloway, known for its associations with the poet Robert Burns.In 2002, Ayr was one of four Scottish towns competing for city status to mark Queen Elizabeth II's Golden Jubilee, losing out to Stirling. The oldest hotel in Ayr, the Swallow Station Hotel is housed in an imposing, four-storey Victorian building, sited adjacent to the train station and 500 metres from the beach. Guests can relax over drinks in the Gallery lounge bar, enjoy morning cappuccinos in the coffee shop, or browse for souvenirs in the gift shop. Open daily for dinner, the Kyle Restaurant offers a blend of traditional Scottish and European dishes with a modern twist, alongside an extensive wine list. Ayr beach is located 500 metres from the hotel, while the former home of celebrated poet Robert Burns is one mile away. Culzean Castle, which offers a military museum and miles of woodland walks, is 15 miles from the hotel. Prestwick International Airport is five miles away, with an approximate driving time of 20 minutes. 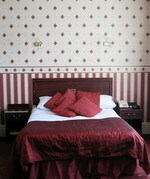 The Ivy Rooms is located in Ayr, Scotland, 200 metres from the town centre and one mile away from Burns Cottage. 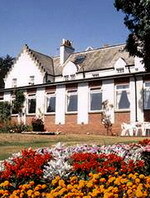 The hotel is situated two miles from Belleisle Golf Course and three miles from the Electric Brae. The Ivy Rooms offers complimentary newspapers, and staff at the front desk can assist with queries. Free parking is available nearby, and the hotel offers a dry cleaning service. The onsite function suite and private dining area offer tailored a la carte dining for up to 120 people. A complimentary Scottish breakfast is provided daily. The guestrooms are spread over two floors and feature direct-dial phones, satellite television, and desks; further amenities include hair dryers, trouser presses, and complimentary newspapers. Cumbernauld is a new town in North Lanarkshire, Scotland. It was created in 1956 as a population overspill for Glasgow City. It is the eighth most populous settlement in Scotland and the largest in North Lanarkshire. The name comes from the Scots Gaelic comar nan allt, meaning the meeting of the waters as, geographically, from its high point in the Scottish central belt burns (streams) flow west to the River Clyde and east to the River Forth. Dundee is the fourth-largest city in Scotland and, fully named as Dundee City, one of Scotland's 32 local government council areas. It lies on the north bank of the Firth of Tay, which feeds into the North Sea. Dundee and the surrounding area has been continuously occupied since the Mesolithic. The port developed initially on the back of the wool trade exporting wool from the Angus hinterland. Once it was cheaper to produce linen, which had supplanted the wool trade and was itself under pressure from cotton abroad, the weavers turned their skills to weaving imported jute. The weaving industry caused the city to grow rapidly with many migrant workers though the town contained very few stone buildings prior to 1860. In this period, Dundee also gained a reputation for its marmalade industry and its journalism, giving Dundee its epithet as the city of "jam, jute and journalism". In 2006, the population of Dundee City was estimated to be 141,930. Dundee's recorded population reached a peak of 182,204 at the time of the 1971 census, but has since declined due to outward migration. Today, Dundee is promoted as the City of Discovery, in honour of Dundee's history of scientific activities and of the RRS Discovery, Robert Falcon Scott's Antarctic exploration vessel, which was built in Dundee and is now berthed in the city harbour. Biomedical and technological industries have arrived since the 1980s, and the city now accounts for 10% of the United Kingdom's digital-entertainment industry. Dundee has two universities—the University of Abertay Dundee and the University of Dundee. 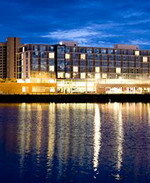 The Apex City Quay Hotel and Spa is a four-star, deluxe hotel that sits at the center of a new quayside development and offers fantastic river, bridge and quay views as well as easy access to shopping and dining. Come and experience the waterfront lifestyle. The 152 bedrooms are chic, with cool, calming interiors. The Alchemy Restaurant serves Scottish and French-influenced cuisine and offers view of the waterfront. The Metro Restaurant is a treat, offering leisurely dining with an emphasis on both flavor and the art of presentation. The Metro Brasserie serves a menu of classic and contemporary dishes in a relaxed environment. At the Yu Spa and Wellness Gym, you can relax and rejuvenate in the healing waters of the pool, hot tubs, sauna and sanarium. 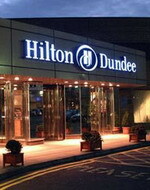 The Hilton Dundee is a modern hotel set on the banks of the River Tay, adjacent to Captain Scott's Discovery and within 500 metres of the city centre. Health-conscious guests can work out in the fully equipped gymnasium, and then unwind in the sauna and steam room. Other facilities include an indoor swimming pool and a dance studio where guests can join classes ranging from step aerobics to body combat and yoga. Overlooking the River Tay and the Tay Road Bridge, the open-plan Riverfront Restaurant offers international and traditional menus alongside hot and cold buffets, prepared using local produce. Caffe Cino is a continental coffee shop serving flavoured coffees, light snacks and a selection of fresh pastries, and opens onto a terrace during summer. The hotel is within 500 metres of the city-centre shops, and the Tay Road Bridge, the Verdant Works, an industrial museum housed in a converted factory, and the Sensation science museum can all be found within half a mile. Surrounded by country gardens in Dundee, Scotland, the The Landmark Dundee is a Victorian Manor House within five kilometres of Mills Observatory. Buffet-style breakfasts are served each morning for a surcharge. The conservatory's airy Garden Restaurant serves a brasserie-style menu for breakfast and dinner, overlooking the Italian gardens. The cocktail lounge leads to the garden, nature trail and playground, and serves lunch and light snacks. Guests mingle at the afternoon tea on the sun terrace. The on-site health center includes a 10-station fitness room, an indoor heated pool, spa tub, sauna and solarium. Admission is free to the Mills Observatory, a classically-styled building with a papier-mâché dome, where a Victorian refracting telescope is used to show the public the night sky. A small planetarium is also housed here at the United Kingdom's only full-time public observatory. Dunfermline is a large town in Fife, Scotland. It is located on high ground 5 miles (8.0 km) from the northern shore of the Firth of Forth on the route of major road and rail crossings across the firth to Edinburgh and the south. Dunfermline has a population of 45,462, making this the second-largest settlement in Fife. Dunfermline was a capital of Scotland, being an ancient seat of the kingdom's Royal Court and an important ecclesiastical centre. Its former abbey, now a parish church, is the burial place for many in the country's line of monarchs including Robert I and Saint Margaret. Ruins of the former abbey infrastructure today include the remains of the Royal Palace of Dunfermline, birthplace of Charles I, and are an important tourist attraction. The poet Robert Henryson, one of Scotland's major literary figures, was also associated with the abbey. In modern times, the most famous son of Dunfermline was the wealthy industrialist, businessman, and philanthropist Andrew Carnegie. He was the central figure in promoting its early 20th century urban renewal and his financial legacy is still of major importance. Traditional industries in Dunfermline's catchment area have principally involved textiles, engineering, defence and electronics. In more recent times this has begun to diversify into the service sectors, including tourism. 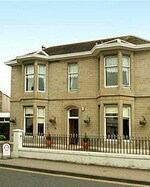 The Pitbauchlie House Hotel is located in Dunfermline, Scotland, 16 miles away from Edinburgh's zoo and city centre. It is four miles from Deep Sea World and one mile from Andrew Carnegie Museum. The hotel's front desk is open 24 hours a day and the public areas are air conditioned. The multilingual staff are able to offer currency exchange facilities and computer rental services. Pitbauchlie House Hotel offers Scottish and French dishes in Restaurant 47, and provides a complimentary breakfast every day. Bar 47 offers malt whiskies and other drinks in an avant-garde setting. Harvey s bistro is housed in the conservatory and food can be pre-ordered, ready to eat on arrival. There is also 24-hour room service. Complimentary wireless Internet is available throughout the hotel and there are conference rooms with audio-visual equipment in the modern business centre. Elgin is a cathedral city and Royal Burgh in Moray, Scotland and is the administrative and commercial centre for Moray. The city originated to the south of the River Lossie on the higher ground above the flood plain. Elgin is first documented in the Cartulary of Moray in 1190. It was created a Royal Burgh in the 12th century by King David I of Scotland and by that time had a castle on top of the present day Lady Hill to the west of the city. 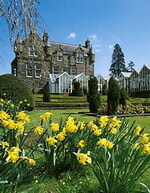 The Eight Acres Hotel is located in Elgin, Scotland, half a mile from a distillery, and two miles from the Cathedral. 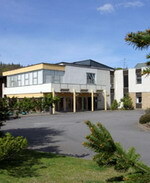 The River Spey and beach are five miles from the hotel. This hotel features a health club, massage-treatment room, lobby with complimentary newspapers, restaurant, and bar. Wireless Internet access is offered throughout the hotel, and drivers will find complimentary parking on site. A complimentary full Scottish breakfast is served daily to guests of the Eight Acres Hotel. Bar food is offered at the Papillon Cafe Bar, and a selection of Speyside malts is available. The Garden restaurant features views of the hotel gardens, and offers a Table D'Hote menu of Scottish cuisine. 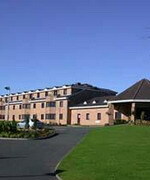 The Hotel Leisure Club features an indoor swimming pool, gym, sauna, massage-treatment room, and spa bath. Live jazz is on offer at the Cafe Bar on Thursday evenings. Fishing, bird watching, ice skating, and a children's playground can be found in the vicinity. There is a golf course one mile away, and a beach five miles from the hotel.